One thing that we pride ourselves on here at Exodus is providing our clients with an absolutely amazing experience! We love having return clients, and we always make sure that they have a memorable escape every time. Recently, we had a very special return client and it truly made our day! 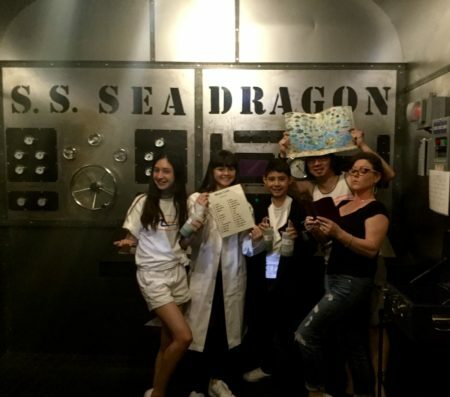 On October, 6th, 2015, Lola came and played her first ever escape room at the Exodus Anaheim location. On that momentous day, she played our original Sherlock’s Study and had such a great time that she came back later that same day to conquer our Trap room (which to this day remains one of her favorite games). After that, she was hooked! In the past 4 years, Lola has gone on to play more than 30 other escape rooms, from Anaheim to San Francisco to Chicago, including rooms at 3 of our locations across California! Just recently, Lola returned to our Anaheim location to conquer our newest room: SUBmerged. For a few minutes before and after their game, we were able to sit down with Lola and her group and ask her a few questions about her experiences here at Exodus Escape Room! Upon her arrival, we asked Lola what she was most looking forward to about SUBmerged. Without hesitation, she stated that she was extremely excited for the new room theme and for the new elements of technology inside! (For those of you who don’t know, SUBmerged is our most technologically advanced room to date.) In SUBmerged, your submarine has crashed, and your team must repair it and restore power before oxygen runs out. Lola said that the unique theme was unlike any other escape room she had done before and couldn’t wait to try it out! We also asked Lola what, in her opinion, made an escape room good. She was quick to respond that she really enjoys rooms that were very creative and different from the norm. The theme of a room plays a big part in her decision regarding which room she will choose and, luckily for us, we’ve managed to impress her every time! Lola expressed her appreciation for how creative Exodus has been in regards to puzzles, game flow, and theming and that the games “still have the basic, like, you have a code, you crack it, but [Exodus has] innovated it” and updated the games to be new and exciting. The layouts of the puzzles, boxes, and keys are designed to help avoid excess confusion during gameplay and, in her opinion, help the overall experience of the players. Besides enjoying the themes and puzzles of our rooms, Lola stated that our employees are extremely friendly, helpful, and outgoing, which really made our day! She said that it is clear that our employees care about the clients and help to make the experience even more welcoming and fun! We pride ourselves on providing a family friendly environment where anyone can feel welcome and we are so happy that we managed to live up to that expectation for Lola! We were flattered to hear Lola say that she has “always graded other escape rooms on this brand because it was [her] first” escape room, and that we have managed to hold that coveted spot of favorite escape room in her eyes! Overall, when we asked her what her absolute favorite part of the room was, Lola immediately stated that it was when her whole team was “screaming around like crazy people” towards the end of the game! They “thought they weren’t going to get out of [the room], so [they] finally just used one last clue” to try to escape. The moment they saw that clue typed up on the screen, “everything started to click, which was why [they] were screaming like crazy people, because [they] wanted to get out!” It got down to that last minute, but the team was able to escape just in the nick of time! Seeing the whole team cheering and laughing as they raced out that final door was one of the best moments of that night for the Exodus team! It was clear that our SUBmerged team’s escape was a blast! We are so glad that Lola and her family returned to play our newest room after waiting for quite some time! Three and a half years after her first escape room with us, she is still enjoying the Exodus experience, has loved seeing how we have grown over the years, and can’t wait to see where we go next! Lola and her group were so fun and energetic and we loved having the opportunity to host them for a 6th time! We know that Lola is just one story out of the many, many return clients we have met over the years, and we want to say thank you to everyone who has supported Exodus and helped us grow into what we are today! We love you guys! ‹ Wedding Parties at Exodus!